This is my go to green superfood smoothie when I get cravings for chlorophyll. I like to mix my smoothies up to ensure I get a good healthy balance of vitamins and minerals (and keep things fun and interesting), but truth be told, I’d have no problem guzzling this guy every day. Starting my day with plenty of greens puts me in a good mood, with plenty of energy, feeling good about myself! 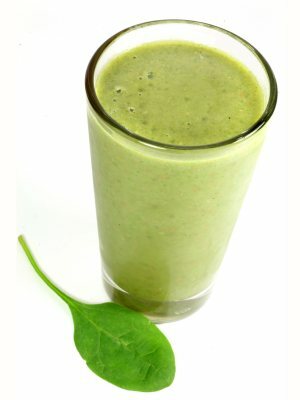 The combination of ingredients in this smoothie provide an abundance of goodness. Let’s delve into the myriad health benefits. Bananas are high in vitamins C and B6, manganese, potassium, and fiber, and are good for the cardiovascular system, eyes, and bones, among other things. Blueberries are rich in vitamins C and K, manganese, and fiber, and help improve cognitive function (brain berries), offer cardiovascular support, are good for your eyes, and are antioxidant powerhouses. The greens, spinach and kale, provide a plethora of vitamins, minerals, and phytonutrients (to many to list). Think antioxidants, anti-cancer, anti-inflammatory, strong bones, and cardiovascular support. What puts this smoothie into the superfood category is the inclusion of spirulina (or chlorella) powder. Both are extremely nutrient dense, complete protein sources, antioxidant rich, excellent detoxification agents, and help the body deal with and overcome a bevy of ailments. I’ll be posting an in depth article on each in the future. Rounding things out is a little cinnamon, which has been found to improve circulation, cognitive function, and digestion, stabilize blood sugar, lower bad cholesterol, and is anti-fungal and anti-bacterial. All these wonderfully healthy ingredients are complimented by each other and ensure you get a full dose of vitamins and nutrients…in a delicious form. Pretty cool how that works – blending all this good stuff into a superfood smoothie :) Enjoy! Place the ingredients into your blender and blend on high until desired consistency is reached, usually around for 30-45 seconds. Please leave a comment below if you try this tasty green superfood smoothie. Happy Blending! Just the recipe I was hoping to find! Thanks Ryan. Heading to the kitchen now! Awesome! I hope your smoothie turned out great! It DID! Absolutely delicious and noticeably energizing! Right on, Tya! Thanks for sharing. I’m going to make this smoothie for breakfast tomorrow. Your recipe sounds much like what I’ve been using. I’ve found that a slice of fresh ginger along with cinnamon masks the stronger tastes of some sprouts or veggies and adds an uncommon pleasure. Plus, ginger is said to be good for the stomach. Hi Martha, thanks for sharing the ginger tip. I don’t add it to my smoothies that regularly, but my mom is a big fan. Ginger is good for digestion and for reducing inflammation among other health benefits. Cheers! P.S. I’ve even added mushrooms to my smoothies. Totally unrecognisable. Really – common edible mushrooms like button or Portabella, or medicinal mushrooms (powders)? I’ve used mushroom powders in the past, but never regular mushrooms. Might have to give them a whirl. This is what I was looking for – I made it following the instructions above (including following all measurements) and it is quite a bit darker in colour than the picture above. I also included a mango cheek instead of the honey, and left out the cinnamon (because I don’t like it). It tastes great and I’m sure it will give me the kick I’m after. Thanks for posting this! Great to hear you enjoyed this smoothie. Using mango to sweeten over honey was a nice touch. You’re welcome, CJ! Great to hear you enjoyed this smoothie. Cheers! Hi I’m planning on making something similar to this smoothie. Going to try out a few different recipes. Just noticed the RDA content though for vitamins. Can you have too much of a good thing in this case? Is 200+% not over doing it? Not even sure if you can ‘over do’ vitamin intake lol. But surely having all that in one go is having too much maybe? You can overdo it and consume too much of a certain vitamin. However, it’s very difficult. The RDA is the amount you need to prevent disease; so it’s pretty low. In my research I found that indigenous peoples often consumed 10 times or more the RDA of most vitamins. This lead to superior health. No need to worry about overdoing it. I have been living with depression & anxiety for several years and consequently suffered from very low energy. Not being able to get anything done otherwise, I propped myself up using energy drinks (i.e. ‘V’). At the height of this I was drinking four bottles a day. Understanding the imperative of removing these drinks from my day, I went cold turkey and would tumble off the Energy Drink Wagon often before finally being rid of them. A couple months ago I stumbled upon Green Smoothies at our local cafe. I knew they would be healthy for me but I had no idea how energised I would feel afterward, and how that energy would be sustained throughout the day. Just tried your Green Superfood Smoothie and it was simple YUM! and I look forward to trying some of your other recipes!